2018 is an off-year election season for the US. Tracy and I previously exercised our right and duty as US citizens to vote, and have continued to vote while living abroad as expats. Our home state of Nevada makes the overseas voting process easy. As in previous elections while we were residents in France, we simply go to the county registrar of voters’ website, in our case the Washoe County (Nevada) Registrar of Voters, to download a simple, one-page form to complete and return by mail with our signatures. We have the option to request to vote in the primary, general, or all elections in 2018. If we were over the age of 65, we would also have the option to make our request for absentee voting status permanent. 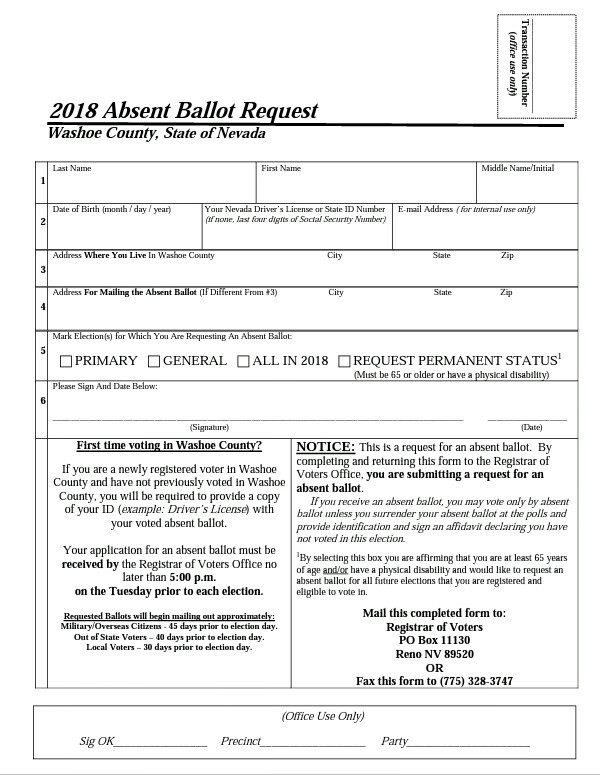 Absentee ballots from Washoe County are mailed to overseas voters like us (and military service members, spouses, and their dependents) 45 days before all elections. THE DEADLINE TO SUBMIT A REQUEST FOR AN ABSENT BALLOT IS THE TUESDAY PRIOR TO ANY ELECTION, AT 5 pm. WE STRONGLY URGE YOU TO SEND IN YOUR REQUEST AS SOON AS POSSIBLE. REMEMBER, YOUR VOTED BALLOT MUST BE IN OUR OFFICE BY 7 pm ON ELECTION DAY IN ORDER FOR YOUR BALLOT TO BE COUNTED. So far, voting absentee with the Washoe County Registrar of Voters Office has been easy and has worked flawlessly for us. But there are other options for oversea voters from other jurisdictions. There are currently over 8 million Americans living abroad of voting age. The Federal Voting Assistance Program helps overseas US citizens, US military service members, and service members’ families to vote. Many state Secretary of State offices will assist overseas voters. Nevada’s Secretary of State has the EASE program, Effective Abesentee to System for Elections, a totally online application and voting process that allows electronic voting for oversea Nevadans, Nevada military service members, and their families for elections that include a federal office race. -US citizens employed by the federal government residing outside the US. -Other private US citizens residing outside the United States. Our home state of Nevada also protects our right as US citizens to exercise our franchise to vote as expats living abroad. Nevada Revised Statutes 293D.210 Eligibility of overseas voter to be covered voter. (b) The overseas voter is not registered to vote in any other state. So Tracy and I will again be exercising our right, privilege, and responsibility to vote in 2018. Now we are just hoping for some highly qualified candidates.